The January 1980 issue of BYTE magazine published an article by Steve Ciarcia entitled "Computerize a Home." In this article Mr. Ciarcia described a method of expanding his home security system to include control of all the lights and AC outlets in the house. In his words, "This expansion seems to be a contradiction considering previous concern over wiring costs. 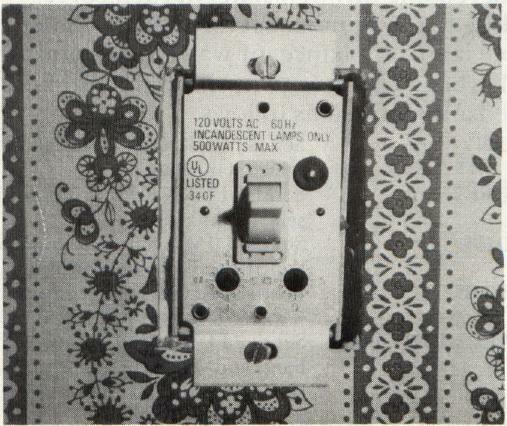 It would appear that every AC outlet would have to be directly wired to the computer through relays or some remote control capability would have to be added to each light and appliance." It is this latter approach that is the basis for this and Mr. Ciarcia's article: more specifically, interfacing a BSR X-10 AC Remote Control System to a computer. His approach differs however, in that it proposes building a relatively simple, but not so inexpensive, hardware interface between his computer (a Radio Shack TRS-80 Model I) and the BSR X-10 command console. This article proposes a software oriented solution. In terms of hardware, it requires no more than the connection of an ultrasonic transducer (2 wires) to the appropriate pins of the PET's user port, thus resulting in an even lower cost. It should be noted that the concept applies to any system with an available output port (one line). The machine language program would require rework depending upon the speed of the system's clock (the PET has a 1 megahertz clock) and the number of cycles per instruction. The BSR X-10 system consists of a group of electronic devices that control the electrical environment inside and outside of of your house. Lights can be turned on and off, dimmed or brightened. Plug-in appliances, television sets, and stereos can be turned on or off. No special wiring or complex installations are involved. The system is expandable by adding more modules, a cordless controller or other command consoles. The system is shown in photo 1 and photo 2. The components are: The command console, the wall switch module, the appliance module, and the lamp module. A cordless controller (not shown) is available, but is not an integral part of the system being presented in this article. The BSR X-10 system is marketed by Sears, Penneys and Radio Shack, to mention just a few, under slightly different product names. The components of one vendor's system are interchangeable with those of another, with one very notable exception. There are two different types of command consoles: one model (X10-014301) that can be remotely controlled with a hand held cordless controller, and one model that cannot! The command console that can be controlled by the hand held cordless controller is a requirement. The buyer should make certain that the BSR X-10 system purchased includes this particular model. Photo 1: The BSR X-10 command console, appliance module and lamp module. Photo 2: The wall switch module replaces the standard wall light switch. As with all the remote modules, it can be locally activated without the command console. Photo 3: The 40K Hertz transducer, shielded cable and receptacle for the PET's parallel user port. The BSR X-10 components are quite inexpensive when compared to the cost of the alternatives. The command console sells for $39 while each remote module sells for $15. ON Sends "TURN ON" command to selected module. OFF Sends "TURN OFF" command to selected module. DIM Sends "DIM" command to selected lamp or wall switch module. BRIGHT Sends "BRIGHTEN" command to selected lamp or wall switch module. ALL OFF Sends "TURN OFF" command to every module, including appliance modules. The user then selects a given lamp, appliance or wall switch module by pressing the appropriately numbered unit key and initiates the desired function by pressing the appropriate command key. This action actually transmits two separate messages to the command console. Figure 1 describes the format of the coded messages (tone bursts) sent by the cordless controller to the command console via ultrasonnic communication. Each of the twenty-two keys on the controller has a unique 5-bit binary code (see table 1). A single message is made up of a start-of-message (SOM) code, one 5-bit binary code, the logical inversion of that 5-bit binary code, and an end of message (EOM) code. One message is approximately 100 ms in length and is composed of thirteen segments. Each segment is 8 ms in length. The start of message segment consists of a 4 ms 40K hertz tone followed by a 4 ms period of silence. 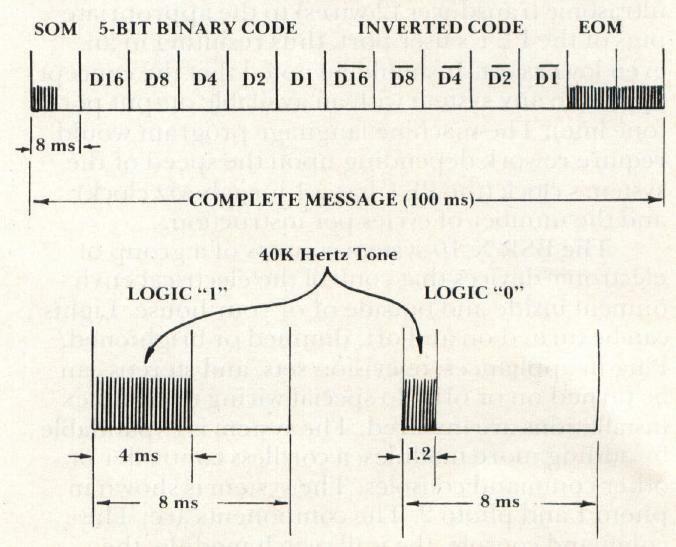 Each segment of the data (5-bit binary code or inverted 5-bit binary code) consists of a 4 ms 40K hertz tone for a logic 1 or a 1.2 ms 40K hertz tone for a logic 0, followed by a silent period of the appropriate length. The end of message code consists of two 8 ms segments, each containing a 40K hertz tone for the complete duration. All messages use exactly the same format; only the 5-bit binary data codes vary. Safety is the primary consideration. There is no hazard in using the controller or any of the remote modules as long as their cases remain intact. The BSR X-10 is Underwriters Laboratories listed. The PET must remain electrically isolated from the command console at all times. This is accomplished with communication in the form of ultrasonic sound transmitted through space by the transducer attached to the PET's user port. In essence, the PET software will simulate the activity of the hand-held cordless controller. The hardware task consists of soldering the two wires of an output transducer to pin C (PAO) and pin A (GND) of a receptacle for the PET's parallel user port. The cable between the transducer and the receptacle is typically shielded (see photo 3). 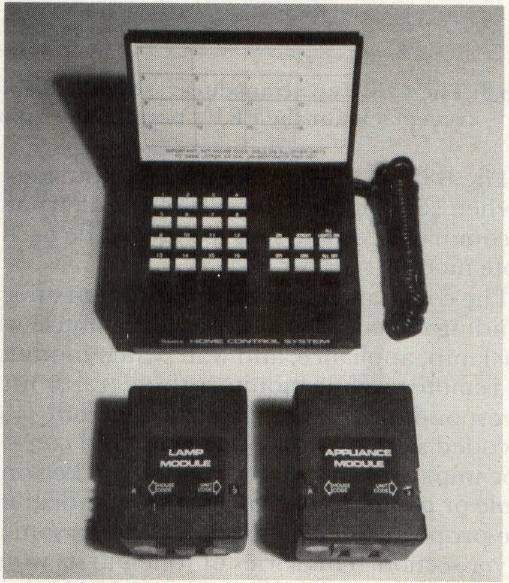 Figure 1: Description of coded message sent from cordless controller to the command console. 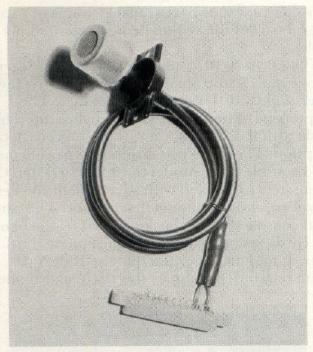 The transducer shown in photo 2 was obtained from a local electronics surplus store, giving reason to believe that the 40K Hertz transducer is relatively common. Another possible source would be the service department of a local TV dealer. Most remote TV controllers today make use of ultrasonic transducers. The effective range of the transducer is approximately twenty feet. When testing, various distances from the command module should be tried. Experience with several different transducers has shown that some failed to activate the console if positioned extremely close while others worked only in such a position. Program 1 shows a simple BASIC driver program that serves only to demonstrate how the machine language sub-program should be used. Line 100 requests the user to enter the decimal data code for a given remote unit or a given function. If valid, the value is poked into location zero and the machine language program is executed. This is repeated several times to ensure success. During testing, this loop count should be increased. The REM statements in the program merely document the unit and function codes. If the program is listed just prior to running, the codes will be readily available (displayed on the PET screen) during the demonstration. Program 2 is an assembled version of the 6502 machine language program required to generate the thirteen 8 ms segments that make up a single message. The routine begins by initializing the data direction register (E84316) for VIA data output port A (E84F16). PA0 is defined as an output line and PA1 through PA7, although not actually used, are defined as input lines. The remainder of the mainline routine is subdivided into segments containing calls to appropriate subroutines to produce the 8 ms segment in question. Labels on each of the subdivisions correspond to the field labels in figure 1 describing the complete message. The 40K hertz tone on the transducer is produced by alternating the logic value (0 or 1) of pin C (PA0) of the user port at a rate of 40,000 cycles per second. This is accomplished by the machine language subroutine labeled "X40KHZ". The period of time that a given 40K hertz tone is produced is determined by the number of times the subroutine continues to loop. The calling program sets register X accordingly. The periods of silence are accomplished by calling the machine language subroutine labeled "DELAY". Again, the period of time is determined by the number of loops. The instruction timings are given in the comments field of the assembled instructions in each subdivision. Table 1: Cordless controller push-button codes and decimal equivalents. The machine language program, as assembled, will load into the high address end of RAM (1C0016). It should be loaded and BASIC's upper memory limit reset prior to loading and executing the BASIC driver program (see a previous COMPUTE! article). The approach used to time the various functions (ie. the program loops and sequences of instructions to produce the desired periods) does not interfere with the PET's clock nor does the clock interrupt handling software produce any undesired effects on these timing sequences. Turning on a table lamp, then, is as simple as poking a value and executing a machine language program. A sophisticated BASIC program can now be developed using the PET's time-of-day clock. Remote BSR X-10 modules can be placed around the home to control a variety of appliances and lights, and all at a much lower cost!